Greetings crew, I hope this email finds you well. I am hoping for help with identifying a fish that I have obtained. This fish came into my LFS with a shipment of Peppermint Tetras and I have been trying to properly identify it. This was the only fish of this species that came in with the shipment. 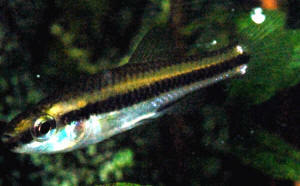 It is about 3 inches long and swims near the top or the aquarium, and is somewhat active. I figured that this was most likely some sort of schooling characin, although it hasn't been nippy or aggressive to the other fish in the tank (several Loricariids, Pencilfish, red phantom tetras). I am thinking it is very possibly a Bryconops species, possibly B. magoi, based on the caudal peduncle shape. 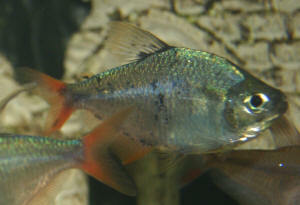 <Does seem a reasonable guess, or else one of the more generic Characidae. Unfortunately there are no characin databases or encyclopedias other than Fishbase that I was able to find for further aid. 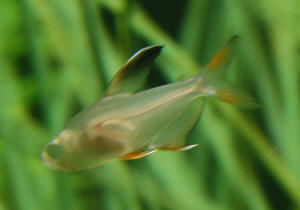 Overall coloration is a shiny silver, with a yellowish tint above the lateral line and some faint yellow tinges to the caudal fin that don't really show up in these pictures. Any ideas as to what this may be? 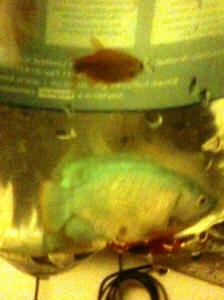 The fish is doing quite well but I'd like to know exactly what I have, mystery fish don't sit well with me. Trust you are all good and having a great week. I was wondering if you could help - someone down the road is getting rid of his fish and asked if I would like them. I have another tank (AquaTropic 80 (110L) planted tank with 10 neon tetras and 2 male guppies 7 female platys into this tank. But do not know what the others are. Could you help id them and should I get them. I have a 30L tank as well. I have six fish in my aquarium that were given to be three years ago that I would like to identify. I think the person who gave them to me said they were Rasboras, but it's been so long, I can't really recall. 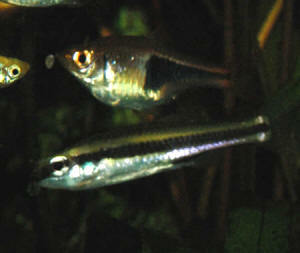 I have two of each of the three fish in the attached pictures. I know they aren't the greatest pictures but they were not complying with my request to be still! All of them are under two inches, dart around rapidly, get along well, and harassed the Betta I had in there a while back until I took him out. I would like to get more fish to go into the tank with them, but I'm reluctant to do so until I can identify them and make sure they are compatible with anything else I purchase. They are all in a 40 gallon aquarium in my classroom, so there is ample room for more fish. I would like to get more fish to go into the tank with them, but I'm reluctant to do so until I can identify them and make sure they are compatible with anything else I purchase. They are all in a 40 gallon aquarium in my classroom, so there is ample room for more fish. Lesley from Scotland here, its been a while since I was in touch, my planted community tank now nearly 4yrs is doing great! My daughter has a small tank now and we purchased some Endler's. I have a male in my community tank and one in my daughters along with what I thought was a female. They are very hard to come a cross the females and I thought what a stroke of luck that this wee female was swimming around with all the males so we took her home. 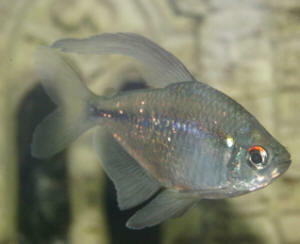 After looking on line she looks a bit different to the ones that I have seen on the web she is dark in colour with a neon red speckle on the rear end of her body, is she an Endler? 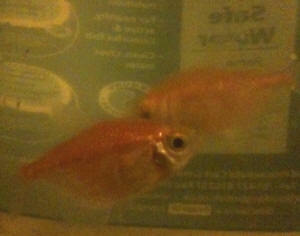 Sorry for the bad photos but she is such a flighty little fish. Sorry about the influx of repeated mails, anyway I have taken a better picture. Can you help identify this wee fishy, she was swimming around in our local garden centre with a whole load of male Endler's. I assumed she was a female, but she looks a lot different to the pictures on the net. Thanks for all your assistance once again. only had 11) so the total is now up to 12. This new tetra looks identical to the other 11 tetras in the school--except s/he is lacking the black dot located behind the eye. At first I thought it was stress-related but the fish has adapted well and is eating... but no spot. Is there such a thing as subspecies? <The problem here is that what the industry calls "Serpae Tetras" can be any one of multiple closely related species in the genus Hyphessobrycon. Fish identification help 2/25/09 Hello! I wonder if you can help me out. I have collected around 15 fish from a lady who was moving house and looking for someone to take her fish and re-home them.. however she was a bit vague about what she had. Whilst I recognize the upside -down catfish she gave me, plus the red-tailed black shark and the Puntius pentazona, I am not sure about the 'various tetras'. I have some pictures - could you possibly help me out and advise what I have been given?! 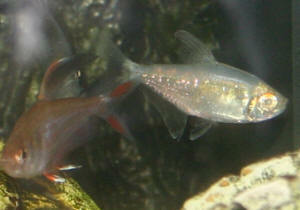 <Fish 1 is the Diamond Tetra (Moenkhausia pittieri). A nice community fish; generally does well so long as the water isn't too hard. 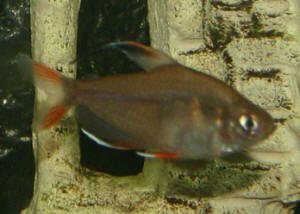 Fish 2 is the Colombian Tetra (Hyphessobrycon colombianus), a semi-aggressive species prone to fin-nipping but otherwise a good choice for robust community tanks. Fish 3 is one of the Rosy Tetra group, possibly Hyphessobrycon rosaceus but there are a bunch of similar-looking species such as the Bleeding Heart Hyphessobrycon erythrostigma and the Ornate Tetra Hyphessobrycon bentosi. They're all fairly good community fish, though a trifle boisterous. Fish 4 is some type of Hyphessobrycon, but to be honest I can't really tell from the photo which one.> I need to be sure these guys will be happy in with my current set up of Platies, Danios, Puntius pentazona, bristle nose Ancistrus, Trichogaster leeri and Crossocheilus Siamese (sorry for spelling, true SAE) in a 180ltr tank. I am fairly sure the red-tailed black shark will be finding alternative accommodation, as he will not get on with my SAE's I understand. <Indeed.> Also, one fish has a cloudy eye (fish 4). He seems fine, there is no sign of bulging or similar, and is eating well. I do not know his history of course, but I am treating him with caution! 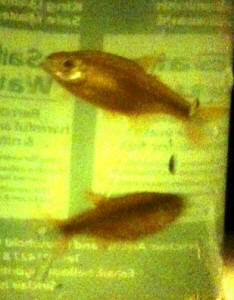 He is the fish which is whiter than the others and smaller in the picture. All are currently in my 'spare' 60ltr tank whilst I assess what to do with them. <Likely physical damage related to netting, transport. Should heal by itself if water quality is good. Treating with an anti-Finrot medication will help.> Thank you!